Get involved! 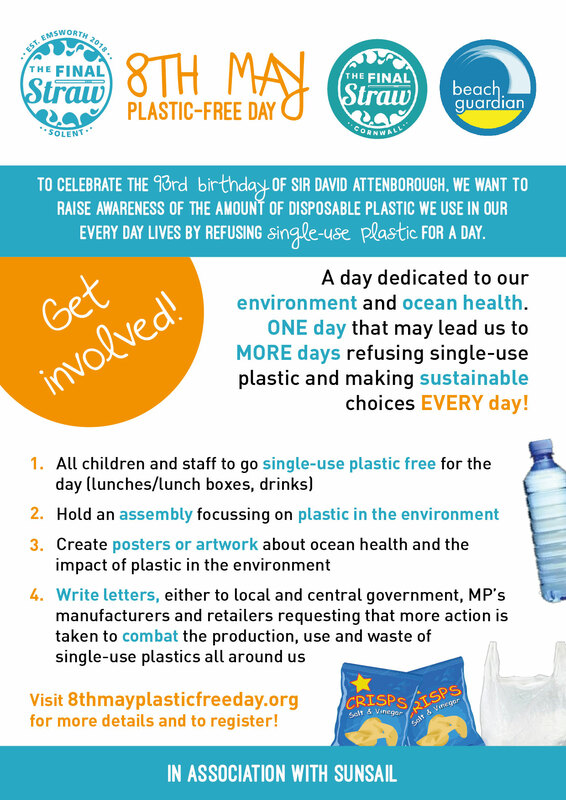 We are asking schools, businesses, community groups and individuals to join us in a day of refusing single-use plastic on the 8th May, which is the 93rd birthday of Sir David Attenborough! Many of you will have seen coverage over the last couple of years of the dreadful levels of plastic pollution in our oceans, which is harming wildlife and even getting into our own food chain. Please email us at finalstrawsolent@gmail.com if you would like to join in the day and be added to our list of participants! Download Activities and Resources for the day! In the UK alone, we use an estimated 35 million single-use plastic bottles, 7 million disposable coffee cups with their plastic lids and lining, 8.5 million plastic straws and around 16 million packets of crisps EVERY DAY! Only 9% of the plastic waste that we humans have created has been recycled, and around 8 million tonnes of it enters the oceans every year, from littering, dumping and mishandling, and can hang around for hundreds of years. 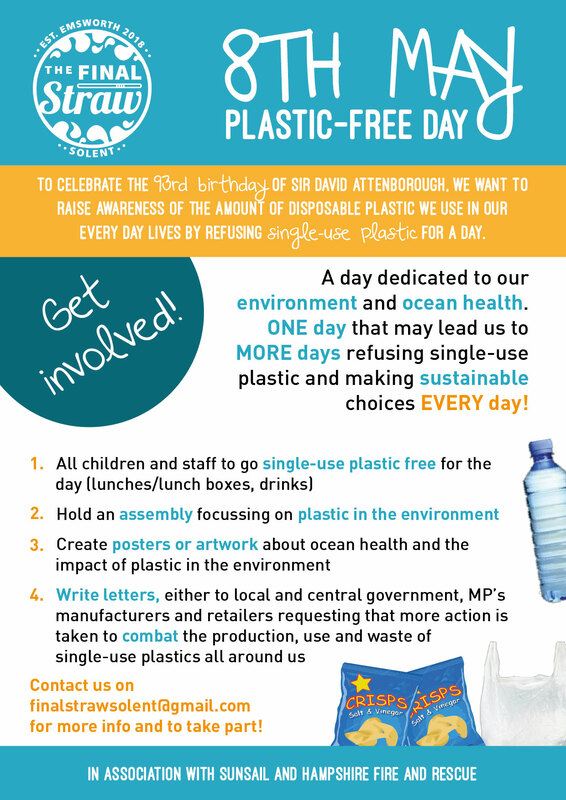 To help our children understand the impact of plastic on the environment, we are organising a day of refusing single-use plastic. We will be encouraging schools to have a day where the children learn about the issues surrounding plastic pollution and ocean health and how we can make a difference in our day to day lives by making more sustainable choices. We are encouraging them to write letters to manufacturers and MPs to ask them to try to cut back the amount of pointless packaging that we see every day on shop shelves. We are asking that children who have a packed lunch at school come in with no single-use plastic packaging in their lunch box – so no disposable bottles, crisp packets etc. Sandwiches and other lunch box contents could be wrapped in tin foil or come in a container (plastic such as Tupperware is reusable and is acceptable! ), and please make sure your child has a reusable water bottle with them. We will be talking to our suppliers and caterers to ensure that they use no or minimal plastic packaging on the day. We hope that taking part in this day will help our children to learn about how we can reduce the amount of plastic pollution endangering our wildlife and environment, and to be extra vigilant about littering and choosing to avoid single-use plastic wherever possible. It is a day of making changes to our habits that hopefully will lead to more days of being aware of how simple switches to more environmentally friendly options can make a difference. A big thanks to Hook-With-Warsash CE Academy for taking part in the first one last year. Thanks also to Sunsail, Hampshire Fire & Rescue, 11th Hour Racing and KEEN Effect. Event run by Final Straw Solent, Beach Guardian and the Final Straw Cornwall.